There were four series under the Hall of Fantasy banner, all produced by Richard Thorne. 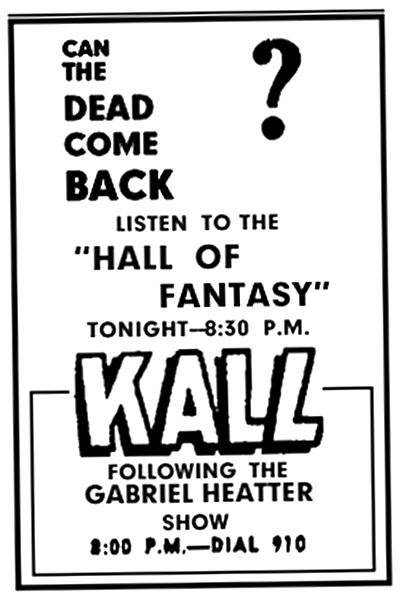 The first Hall of Fantasyoriginated from radio station KALL in Salt Lake City, Utah. Richard Thorne and Carl Greyson were announcers for the station and produced the rather bare bones shows, possibly late in 1946 and into 1947. The shows were written or adapted by Robert Olson and directed by Mr. Thorne. Most were classic murder mysteries with traditional endings, the evil-doer got his just rewards. It ended when Mr. Thorne and Mr. Greyson went their separate professional ways. The Hall of Fantasy aired again in 1949 when, by pure coincidence,Thorne and Greyson were working at in Chicago. This reunion led to their reviving the series. This time, the series featured stories involving struggles against the supernatural where man was usually the loser, specializing in shock endings. On August 22, 1952, Hall of Fantasy went nationwide, over Mutual stations. Richard Thorne wrote original stories or adapted classic works of horror for the shows.